"'Gleichgestaltet'—The Nazi Press, like all other avenues of information in Germany, has been mobilized in the service of the totalitarian regime." Germans are avid newspaper readers, and their "newsboys" are many. On city street corners one sees men and women, each in uniform and cap supplied by some newspaper selling the latest editions. Day and night and in any kind of weather other "newsboys" make their rounds, trudging on foot or cycling from one cafe to another and finding customers. But Germans, eager as they are for news, have difficulty in satisfying their curiosity about what is going on in the world outside. For their government, through its controlled press and radio, tells them only what it wants them to know and in a way to influence their thoughts in a common direction. A set formula is consistently followed. Every day the newspapers are informed on government policy. They receive and follow instructions on what to print about it. In addition, they get the report of the official news agency, the Deutsche Nachrichten Bureau, whose version must be used—in part, if the editor chooses—for decrees, speeches and many other things. A speech by Adolf Hitler, for example, cannot be reported freely; it must be transcribed, approved by the speaker, and then released by the official agency. As that agency recently put it, in a time of international crisis the German press, radio and all avenues of information should be mobilized, like the army and industry. It should not, by any indiscretion, embarrass the home officials responsible for negotiations. In brief, the Fuehrer must at all times be depended upon to decide what is to be printed, and how, and when. In the Third Reich, therefore, when a citizen is unsatisfied with his morning paper account of an important political happening he does not—as he might in a democracy—rush out to find what a rival paper is saying. He can be certain that all German papers are printing the same thing. He may wait until noon, when foreign newspapers arrive from London, Paris, Switzerland, Holland or the Scandinavian countries, to get a less stereotyped version and form his own estimate of happenings. But this method has limitations. The citizen may find that street sales of the foreign paper he wants to buy have been banned, either temporarily or permanently. At least two papers from New York, four from Switzerland, two from England, three from Paris, one from Sweden and possibly others are under the permanent ban. If the citizen asks for one not on this list, a whispered "verboten" from the newsboy may inform him that it has been suppressed because of an article in that day's issue. The usual method, then, of satisfying one's curiosity is to talk with neighbors or, in a more cautious way, with strangers in a restaurant or street car. "What have you heard?" has become a substitute for the "I saw in the paper" of most other countries. The amount of news that circulates by word of mouth is amazing and, as might be supposed, so well embroidered in the repeating that it is nearly impossible to distinguish between fact and fiction. "What does the Strasbourg radio say?" may be safely asked if one knows one's informant fairly well. That station across the border broadcasts its news report in German as well as French. Or, "Did you hear the Moscow radio?" may even be asked among close friends. The Moscow sender talks to the world in many languages, its messages varying accordingly. Science has not found a away to keep it out of the air over Germany, nor has it been possible to enforce completely the law punishing anyone who listens to it. How it gets its information is a mystery, but it often is up to the minute with names, addresses and timing on incidents that have happened in Germany only a few hours past. There is one other method of getting uncensored accounts of political happenings. It is to accept the clandestine newspapers which uncaptured Socialists and Communists run off in secret printing plants. Germans who depend entirely on the regular press for their news get a great deal of staid and serious information. Some dailies specialize in finance and trade. Nearly all devote much space to editorials and to a wide variety of subjects including such as books, architecture, the theatre and the latest fashions. A Berlin newspaper will have about eight department editors, who also do the reporting. It may have several times as many correspondents abroad or in cities. The sports editor covers the best sports event of the day and the official news agency covers the others. Other editors will cover courts, city affairs, police and other "runs" in much the same manner. No single subject, however, gets as much space as in a large American newspaper, and details are often lacking. A report of an airplane accident, for instance, says six were killed but gives no names. And some of the news appears to come from odd places. On a recent day a "cable" giving Argentina's reaction to the Pan-American Conference at Lima came from Milan, in Italy. On the same day the funeral of Kemal Atatürk in Turkey was described in a telegram from Paris. A dispatch from London told of a fire in California. A dispatch ostensibly from New York told of a lynching in Mississippi under the caption "Humanity"—a suggestion of the official agency which was carried by all newspapers. One might get the impression from the papers that German Government and party officials devoted all their time to dedicating new buildings, receiving tributes from the populace or their colleagues, or issuing decrees and making speeches. 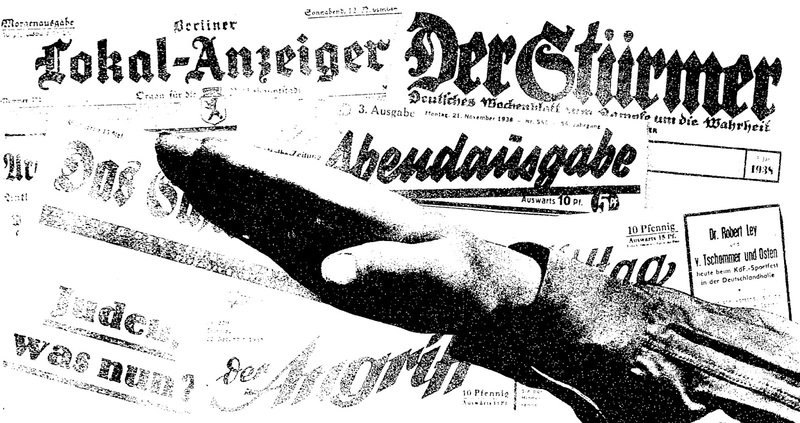 The Völkischer Beobachter, the Hitler and party organ published by Alfred Rosenberg, and Der Angriff, the Goebbels publication, may be taken as the most official of Berlin newspapers. (The Beobachter is published also in Munich, Vienna and Cologne.) On a recent morning more than one-fifth of what was classed as news in the Beobachter consisted of speeches by party leaders, and more than a quarter of all the reading matter was about Jews, the principal topic at the time. In the Angriff, on the afternoon of the same day, two-fifths of the news was a speech by Propaganda Minister Goebbels, and there were reports of other speeches. Two methods frequently used, in the interest of Nazi policy, are the suppression, delay or distortion of important news and the directing of a bitter press campaign against some foreign nation. The editors often direct their wrath at the newspapers of republics, referring to them as the "Hetze-Presse" (baiting press). Thus, in the issue of the Angriff just referred to, the headline across the front page over a cable from New York was "Murder Baiting in the U. S. A. 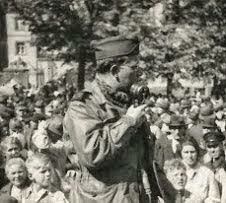 Against the Third Reich." Yet the German press itself almost always seems to have a "Hetze" on about happenings in one foreign land or another. Russia, with its communism, is standing material for a German "Hetze." Czecho-Slovakia, at the time of the Sudeten issue, felt the "Hetze" in extreme measure. So did Great Britain a little later. After a group of Rumanian Nazis, called the Iron Guardists, were killed by their Rumanian guards, the direct "Hetze" was withheld for political reasons; instead the press reprinted only foreign comment attacking the shootings—a sort of reflected "Hetze" for which Germany was not primarily responsible. At the present time the "Hetze" is turned against the United States. For an understanding of how the German press works let us trace some events beginning with the Czech-Slovakian crisis. The first of two messages from President Roosevelt during that crisis, containing a general admonition for peace, was delayed from twenty-four to forty-eight hours in Germany. Before it appeared, "in part," Chancellor Hitler at a Berlin mass meeting declared his hopes for peace. The delay deprived Mr. Roosevelt of any "scoop" in Germany on the peace idea—as Minister Goebbels later explained was intended. The second message, in which Mr. Roosevelt laid on the Fuehrer the responsibility for peace or war, was not published in German papers, although it was in the foreign papers that entered Germany. Moreover, the mobilization of the British fleet toward the end of the crisis, which might have dampened the German ardor for forcible measures, missed press mention. After the Czecho-Slovak crisis came the concerted outbreak through Germany of window-smashing, store-wrecking and synagogue-burning on Nov. 10, following the shooting of a German diplomat in Paris by a young Jew named Grynszpan. Newspapers in other countries gave great space to the details, but the Berlin papers printed only vague accounts. The next morning a ninety-word statement from Minister Goebbels appeared, together with a 175-word official news agency explanation of the reasons for the "spontaneous national uprising." These statements were unaccompanied by any details or summary of what had happened in the country. Outside of Berlin a few newspapers carried local stories, and the official agency sent out a report for use abroad—but not inside Germany. In the official New Year's summary which every newspaper printed of history-making events in Germany in 1938 there was no mention of the outburst; the event recorded for German history on Nov. 10 was the death of the President of Turkey. Every one in Berlin had seen some part of the property destruction, and in the absence of adequate newspaper accounts the news traveled swiftly by word of mouth. Within twenty-four hours after Field Marshal Hermann Göring had decreed a 1,000,000,000-reichsmark penalty against the Jews for the Grynszpan crime every one who had ventured out of doors had heard the latest. "Who is the greatest alchemist the world?" was the question. Some German newspapers attempted to connect Winston Churchill and others with the Paris assassination. The British Minister to Berlin made a formal protest. The papers did not report it. Instead, they turned their guns toward America, and the "Hetze" against the United States was on in a mild way. The reaction of American newspapers toward the Nov. 10 "uprising," expressing sorrow or horror at what they regarded as a German lapse from civilized law and order, was attributed to Jewish influence and, it was said, justified further repression. The departure of the American commercial attaché from Berlin, following the return home of the American Ambassador, went unreported. Several American Congressmen who had criticized the "uprising" came in for a baiting, however, although the German readers were not told what they had said. Then Secretary of Interior Ickes made his Cleveland speech in criticism of the affair and the "Hetze" reached its boiling point. A large scrapbook could be filled with attacks on Mr. Ickes made by the press in recent weeks. These may have puzzled German readers, for the reason that Mr. Ickes's sharpest digs were not printed. The facts that the German Embassy in Washington made a protest against the Ickes remarks, and that this protest was promptly rejected by the State Department, were not printed here until ten days later, and then without the most pointed comments in the rejection. The newspapers contended that if Mr. Ickes had stayed in his office at Washington instead of making speeches the recent drug company and smuggling scandals in New York could not have occurred. Just how the Secretary of the Interior could have stopped these activities which did not fall in the jurisdiction of his department was not explained. Both scandals got a big play in the German papers. The fact that several Jews were named in the smuggling case was always kept in the headlines, while the fact that the principals in the drug-company swindle were of Italian ancestry was ignored—for news must harmonize with politics. Press sermonizing, it seemed, was sometimes more important than the facts. 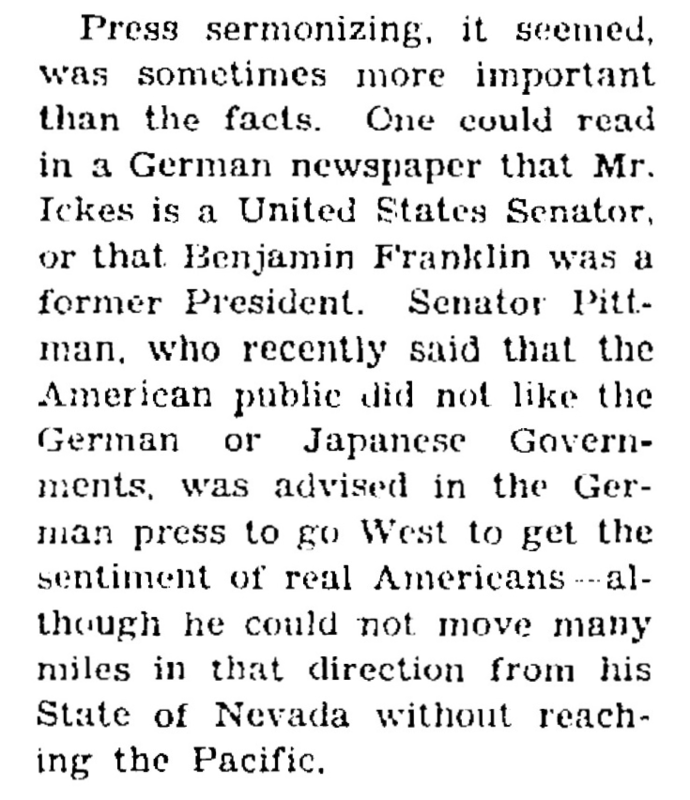 One could read in a German newspaper that Mr. Ickes is a United States Senator, or that Benjamin Franklin was a former President. 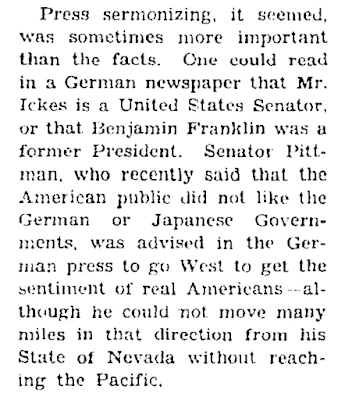 Senator Pittman, who recently said that the American public did not like the German or Japanese Governments, was advised in the German press to go West to get the sentiment of real Americans—although he could not move many miles in that direction from his State of Nevada without reaching the Pacific. Along with the "Hetze" on the Jewish issue has gone a campaign against American efforts to build Pan-American solidarity against totalitarian encroachment. Before the Lima conference the German newspapers devoted space to the reputed sinister intentions of the United States in the western continent. The outcome of the conference was described in the German press as a fiasco for Washington. Unlimited theorizing is possible on the effect of all this on the German people. In a country where newspapers express different views the people think and argue and are free to form their own conclusions. In Germany the older generation—among trusted friends—expresses and argues its opinions quietly. The younger generation is being trained to follow the party line and never to question. Nazis believe that this is the only method to create a united nation which will fulfill the slogan: "One leader! One people! One Germany!"